Though I know these words will eventually (say, in May, when the temperature is 55 degrees and I am crying about the nonstop rain) come back to haunt me, I have to admit that I have been absolutely loving the chilly fall weather we’ve been experiencing around here. The morning fog, the hoodie I have to don each night to stave off the cold while reading in bed, even the torrential rain pounding against the windows—it’s autumn in Portland, and that means it’s time to break out the gratin dishes. Not that one is prohibited from eating a warm, crisp-yet-soft gratin in the summertime, but a gratin in autumn is just so much more fitting than a gratin in the summertime. Of course, a lot this rationale of mine centers around what, exactly, makes a gratin in the first place, and, as with many things in the kitchen, the definition of a gratin is certainly up for debate. 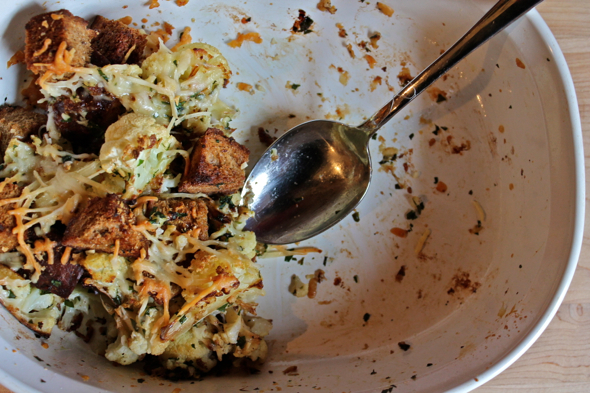 Traditionally, a gratin is a dish with a crunchy lid baked on top, that lid being, more often than not, bread crumbs, cheese, or a combination of both. The word gratin itself refers specifically to the crisp, crunchy bits left behind in a pan after baking, but, as most of us know a gratin, it means a baked dish itself, topped with something crunchy or cheesy, then baked into a state of complete heavenly bliss. As far as gratins go, this one is low on the cheesy scale, but high on the crunchy bread factor. 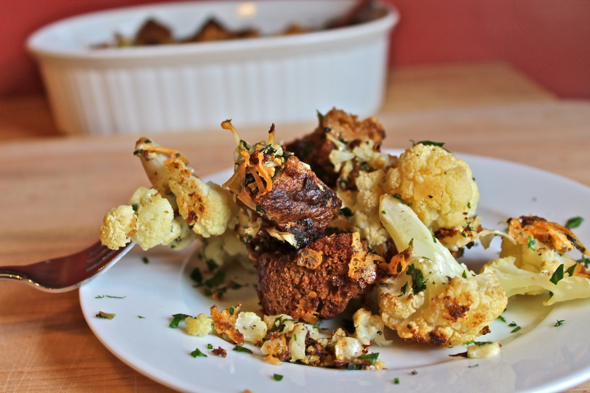 Big chunks of crisp, dense black bread get folded amongst roasted cauliflower, speckled with Parmesan cheese, and dotted with garlic, then baked into a warm, crisp mass of perfect autumn eating. If you’re in the mood for something a bit more decadent, you can up the cheese presence, even using something a bit more melty and gooey, like fontina. 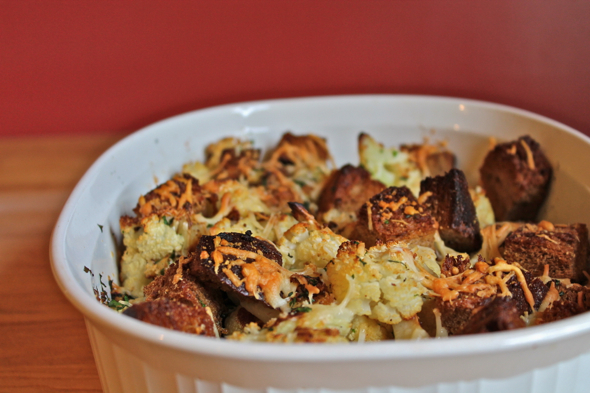 As it appears here, however, this gratin is a great balance of autumn comfort and roasted vegetable goodness. If I can somehow make all my meals as enjoyable as this one, the cold, rainy weather and I should be able to get along just fine. 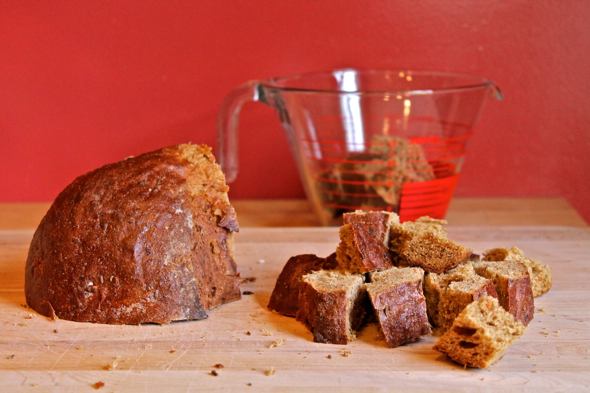 On a large baking sheet, combine bread cubes with 2 tablespoons of the olive oil. Toss the bread cubes to thoroughly coat with olive oil. Bake bread cubes in center of oven for 5 to 8 minutes, until the bread is crisp, but not hard. 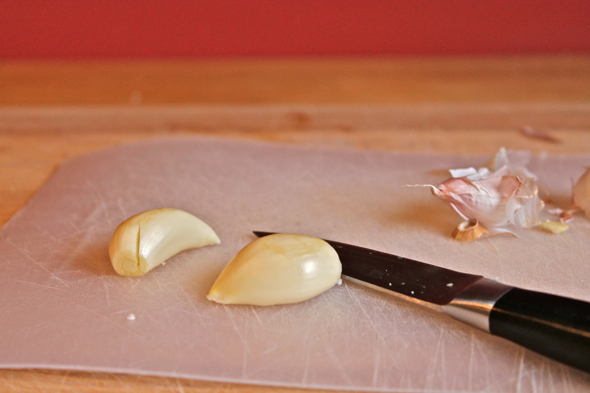 Remove bread crumbs from baking sheet and set aside. 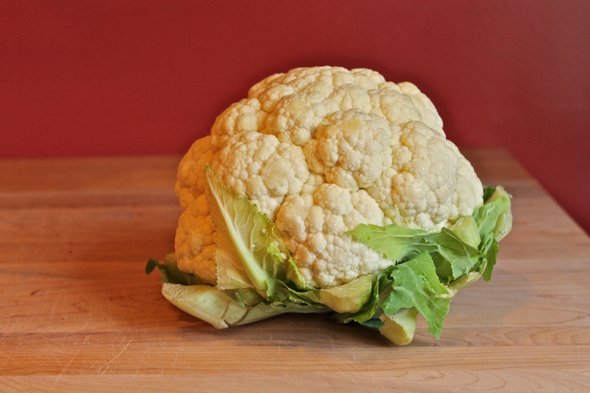 On the same baking sheet, combine cauliflower florets with remaining 1 tablespoon of olive oil. Add salt and pepper, and toss everything to combine. Roast cauliflower in center of oven for 15 to 20 minutes, until the undersides are well-browned and the tops are golden. Remove cauliflower from oven, then, while still on the baking sheet, combine with toasted bread cubes, chopped garlic, and chopped Italian parsley. Carefully toss together to combine. Add salt and pepper to taste. Lower temperature of oven to 350 degrees Fahrenheit. Lightly spray or brush a casserole dish or baking dish (9” by 13” would be a good size, but I used one that was 10” by 7.5” and it worked out wonderfully) with olive oil. Add half of the cauliflower and bread mix, then sprinkle with ½ cup of the Parmesan cheese. Add remaining cauliflower and bread mixture, sprinkle with remaining Parmesan cheese, then bake in center of oven for 35 to 40 minutes, until the top of the gratin is crisp and golden brown. 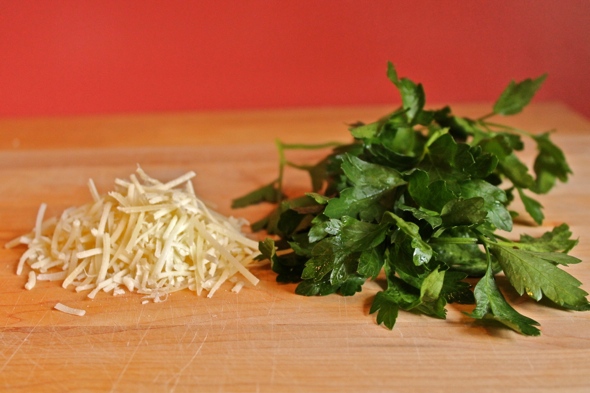 Serve hot or warm, sprinkled with more chopped Italian parsley. Serves 6 to 8 people as a side dish, or 4 people as a main dish. Ooh–a poached egg! The food that makes all other food even better. What a great idea. OMG – this looks amazing. We make a cauliflower/leek gratin but it takes forever. I love the idea of the poached egg – definitely stealing that! 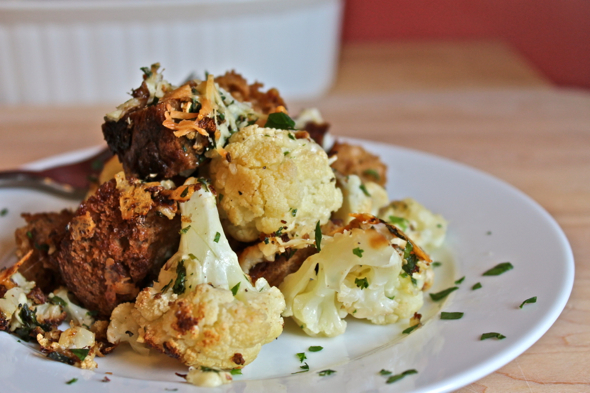 This sounds like a great way to get my husband to eat cauliflower. I love it but he isn’t crazy about it!! Thank you!! Can’t wait to try this – thanks! !